TamoSoft develops cutting-edge security and network monitoring software for the Internet and Local Area Networks, providing clients with the ability and confidence to meet the challenges of tomorrow's technology. Keeping pace with the industry trends, we offer professional tools that support the latest standards, protocols, software, and hardware in both wired and wireless networks. E-SPIN have actively in promoting TamoSoft full range of products and technologies as part of the company Wireless Application Performance Analysis, Wireless Site Survey under E-SPIN comprehensive wireless management solution portfolio - for visualizing wireless landscape, detecting wireless noise, troubleshooting and site survey, reporting use case with other related complementary product solution together for hassle free end to end solution adoption for the user. E-SPIN is active in provide consulting, supplying, training and maintaining TamoSoft products for the enterprise, government and military customers (or distribute and resell as part of the complete package) on the region E-SPIN do business. The enterprise range from telco, wireless research lab, wireless equipment and device manufacturer and vendor, wireless site survey service company, analyst and consultant and other related industry and personnel required wireless management. By using TamoGraph, businesses can dramatically reduce the time and costs that are involved in deploying and maintaining Wi-Fi networks and improve network performanceand coverage in all kinds of environments: office buildings, airports, cafes, malls, or open space areas. In a word, wireless site surveys are necessary because radio wave propagation is difficult to predict, especially in non-open space environments. It is virtually impossible to consider all the variables that might affect the health and performance of your WLAN. Changing conditions, even something as seemingly minor as a notebook equipped with a legacy 802.11g adapter that your new employee connected to the office wireless network, might seriously affect the WLAN performance. In addition, considering the wide proliferation of wireless infrastructure, factors such as interference from nearby WLANs play a very important role. This is why regular site surveys that are conducted with a professional tool are important. At this stage, a site survey is necessary in order to verify that the network plan works well in a real-world environment. Placement of temporary access points and a quick survey of the resulting WLAN characteristics allow an engineer to fine-tune AP and antennae placement, determine the optimal number and types of APs and antennae, and avoid poor coverage zones. 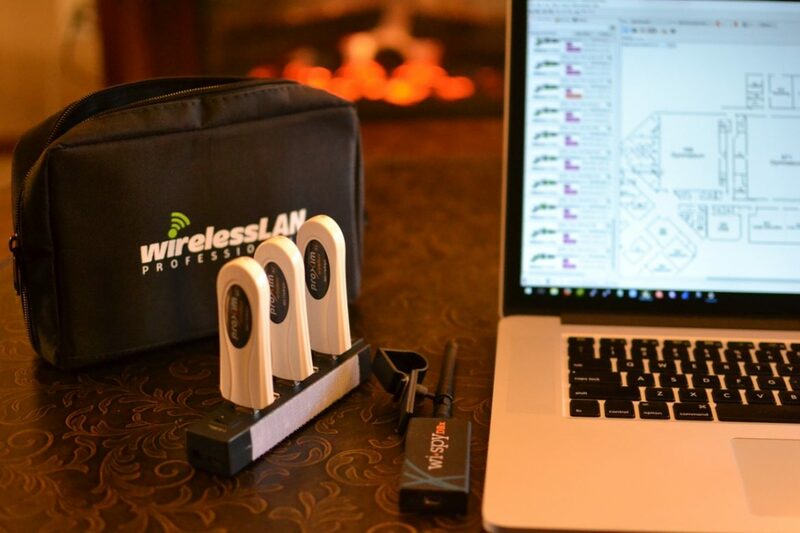 Once a WLAN has been deployed, a complete verification site survey is necessary to ensure that the WLAN performance and coverage meet the design requirements. At this stage, the Wi-Fi equipment placement is finalized and a site survey report should be generated so that the historical records can be accessed at any time in the future. Maintaining high performance and coverage requires regular "check-up" surveys. New users, new equipment, site expansion, neighboring WLANs, and other factors can adversely affect your WLAN. It should be monitored on a regular basis. TamoGraph runs on Microsoft Windows 7, Windows 8, Windows 8.1, Windows 10, Windows Server 2008 R2, Windows Server 2012, Windows Server 2012 R2. Both 32- and 64-bit versions are supported. You can also perform Wi-Fi site surveys using MacBooks. TamoGraph requires a compatible wireless network adapter.